If your bathroom renovation is well planned and auctioned accordingly, the experience can be highly rewarding. However, integrating multiple services within a small wet space can be more complicated than expected. Here are some handy tips that may help you to achieve a successful outcome. First, it is important that you plan your bathroom renovation properly and fix a budget. If significant structural changes are needed, you will need a building permit. This means you’ll need to hire an architect, draftsperson or designer to draw up and submit your building plans to your local authority. To make sure that your bathroom renovation is completed to your satisfaction, hire the services of licensed, qualified and insured tradespeople. This applies not only to builders but also to tilers, joinery suppliers, stonemasons, painters etc. This will ensure you are covered financially and legally in case any problems arise. It will also lower the chance of defective or substandard work. If you live in a house that was built before 1984, it might contain asbestos in the walls, floors or ceilings. Have it checked out and ask your builder or renovation expert to organise a qualified asbestos handler to remove any asbestos. 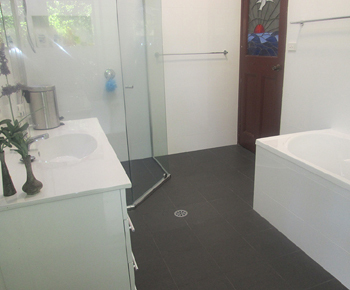 Waterproofing failure in bathrooms is among the top three building flaws in Australia. Be very careful when it comes to the waterproofing of your bathroom. Even when using licensed tradespeople, confirm that all waterproofing will be completed to the AS3740-2010 standard. Choosing bathroom finishes and fixtures for your project can be fun. However, when you’re choosing products to enhance the appearance of your bathroom, remember to check that they comply with the Australian Standards. Sometimes, what you are buying might turn out to be a cheap imported product. To guarantee a quality result, make sure your purchases are compliant.